Has anyone else noticed how many books the Inkies have been producing lately? We've been churning them out like there's no tomorrow. Our Inkwell is overflowing with books; I can hardly even keep up with them anymore. Just think, seven years ago, we were mostly a group of unpublished authors, and now every last one of us has been traditionally published. No matter your reading tastes, the Inkwell has something to offer: from cozy mystery to romantic suspense to whimsical romance, women's fiction, speculative fiction, young adult, and historicals. So I have a few questions for you. Which is your favorite book by an Inkwell Inspirations author? And which Inkwell book are you looking forward to reading? I'll go first. My favorite Inkwell Inspiration book so far is Volume 1 in our Austen in Austin novella collection. 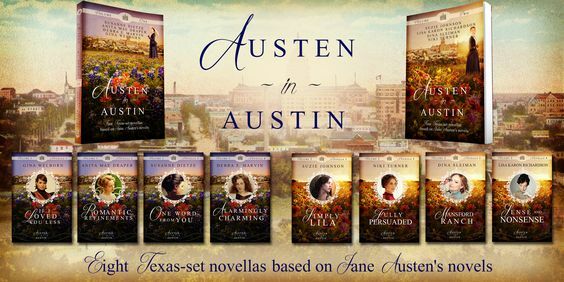 The ties between the novellas were a lot of fun, and the connections to the Austen stories were delightful. Although the stories were written by four different authors, they flowed seamlessly. I enjoyed it from the first page to the last. This book thoroughly tickled me at a time when I had grown weary of reading. If you haven't checked it out, what are you waiting for? And the good news is that Volume 2 will be coming this fall, including my own Mansford Ranch. The book I'm most anticipating reading is Jennifer AlLee's Last Family Standing. I love a book that surprises me and isn't just the same old same old. So I love the fresh and unique premise of this women's novel based on reality TV. Not to mention, I really enjoyed Jen's novel The Mother Road. Now, don't be confused. Last Family standing is already available. In fact it has been for almost two years. I'm just terribly behind on my reading! But this is definitely one I plan on getting to. Your turn! Tell us what Inky books you've enjoyed and what you look forward to reading in the future. I'm really looking forward to Murder on the Moor from Julianna Deering! It's hard to start discussing my favorite Inky books! What I really love is the variety! Aww, I hope you like it, Deb. It truly is my favorite of the series so far. I'm looking forward to Austen in Austin, too! AND everyone else's wonderful books. I have a special shelf JUST for Inky books, and it's growing and growing! It looks delicious. I have a "friend" shelf, too! I'm looking forward to Suzie Johnson's A Fair to Remember. It's on top of my TBR pile for the first day I get to sit down and relax and read!